This unbelievably diverse wonderland is only a short drive from Seattle, and upon the first approach, visitors immediately sense that they have crossed a threshold from a busy human landscape – into an equally burgeoning wild one. Olympic boasts three distinct ecosystems: pristine mountains, lush rainforests, and the longest undeveloped coastline in the lower US. Formed by the collision of the Pacific and North American plates millions of years ago, these rugged landscapes were home to numerous native tribes including the Quinault, Makah, Skokomish, and the Hoh – some of which still call the park home. Visitors can explore more about the rich history of the park and discover more about the earliest natives at Neah Bay’s anthropological museum – operated by today’s Makah Indians. However, it wasn’t until 1889, that the first recorded trek across the Olympic Range was sponsored by the Seattle Press, and the 80-mile distance between Port Angeles to Aberdeen took the group six months to complete. Twenty years later in 1909, President Theodore Roosevelt set aside over half-a-million acres of the verdant rainforest areas surrounding Mount Olympus as a National Monument. Remarkably, it took almost 30 more years to have these pristine areas declared a national park in 1938 by President Franklin Roosevelt. There’s more to the story about the role these two presidents played in ensuring the park’s preservation, and many ranger-guided tours and programs that share the bizarre history of Olympic National’s thirty-year battle with politico’s and the Forest Service. Today, preservationists and naturalists are reveling in the results of the Elwha River Restoration. Removal of the dam began in 2011 and most of Glines Canyon Dam has been eliminated. The Lake Aldwell and Lake Mills reservoirs have drained, allowing the Elwha River to flow unreservedly to the Strait of Juan de Fuca for the first occasion in 100 years. Salmon once spawned here by the hundreds of thousands, and the species is returning to the park with this amazing restoration. Today, it’s much easier to get around and explore the beauties of all three sections of Olympic National Park, with a variety of guided tour buses, planned hikes, lake excursions, and exceptional bird watching outings within the park’s boundaries. Rich in endemic and native plant and animal species throughout the park, this is a nature lover’s paradise. Those seeking relaxation amidst breathtaking, mountain scenery surrounding by lush rainforests will find an ideal respite in the central/northern regions of the park near the Seven Lakes Basin. Proximal to the soothing Sol Duc Hot Springs and the Falls, guests enjoy a spa-like atmosphere indoors and out when choosing Olympic National Park lodging at Sol Duc Hot Springs Resort. Old growth forest, snowy peaks, and subalpine lakes grace the Sol Duc and Hoh Rainforest landscapes. The Hoh Rainforest receives nearly 150—inches of annual rainfall and is teeming with unusual wildflowers, lilies, and many of its glorious sites are on the Olympic Peninsula Waterfall Trail. The grandest place to stay in the southern area of the park is Lake Quinault Lodge, one of the great historic lodges still remaining and in operation in Olympic. Rustic, yet accommodating, this resort hotel was constructed in 1926 and is surrounded by superior sites. 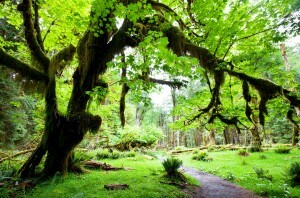 The Quinault Rainforest and the Loop are favorite tours within the park, as are outings on the pristine Lake Quinault, which is still owned by the Quinault Indian Nation. Visitors can enjoy fishing, biking, and hiking at the lake. The farthest reaches of Washington state’s coastline serves as the crowning jewel of the Olympic Peninsula and boasts miles and miles of sands and pristine beaches. The perfect diversity of flora, fauna, and geographic wonders, staying at the one of the most popular lodges in the area, the Kalaloch Lodge, offers guests proximity to the top beaches on the coast: Kalaloch Beach and its remarkable sunsets, the rose-colored sands of Ruby Beach, and the fantastic whale-watching beaches at La Push just outside of La Fork. Finding superior lodging outside the park is simple, and there are many choices ranging from modern to more historic. One of the more interesting options is the Lochaerie Resort, which was built in the mid-20s a boarding house but serves as cabins today. It overlooks lovely Lake Quinault. The lovely Log Cabin Resort is charming and sits on the shoreline of Lake Crescent nestled amid old-growth firs and cedars. The newest lodge is the Dew Drop, which recreates the “Twilight” experience for fans of the Stephanie Meyer books and movies.